Jim Ryan is a motivational speaker whose programs are customized to meet the needs of each sponsor and audience. As a professional speaker, Jim will spend as much time as needed to understand the issues and challenges that each individual audience faces. These efforts make for a meaningful experience for each audience he addresses. A truly gifted inspirational speaker, Jim’s message gets to the heart of his audiences. A talented musician, Jim’s guitar playing and singing in each program serves to disarm his audiences and put them in a relaxed mood to receive his down to earth, insightful messages. This is one of Jim’s signature programs. Thousands have been inspired and motivated to take charge and live happier more joyful lives. Jim challenges his audiences to look within to recognize their true potential and to set the intention to achieve personal success. Jim has the ability to turn profound concepts into easily understood solutions. With quotes, humor, anecdotes and song, the program has folks leaving excited about the possibilities of living a better life. His guitar playing and singing lightens up the program and helps solidify the concepts presented. In Jim’s second signature program is also a very thought-provoking seminar. Here you will begin to understand that your life becomes a manifestation of the thoughts you choose to hang on to. A better life is just a thought away. We discuss strategies for ridding ourselves of negatives and cultivating empowering thoughts. What makes a leader truly successful and fulfilled? How can you motivate your organization to achieve excellence while enjoying the process? How can you maximize performance at all levels and keep the momentum going? 5. How Do You Get There? Do your customer service employees know that they are the “heart” of the organization? Do they feel like an integral part of the organization’s team? Do they understand the impact they have on every person to whom they speak? Do they recognize the leadership skills that they are cultivating and capable of improving? These points are all emphasized in the context of being at your best every day. 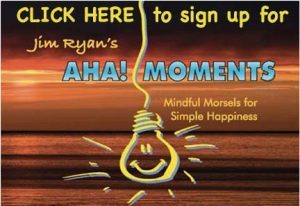 Let Jim Ryan re-energize your customer service team…your customers will be happy and so will your bottom line! Are you following your heart’s desire or are you living in a rut? Have you created a vision of the person you want to be? Are ready to make a change?